A few weeks ago, I had a craving for BBQ chicken. It was 5:30 p.m. – wayyyy too late in the game to slow cook it in a crock pot. Not even fathomable to wait until the next day to make it. I wanted BBQ and I wanted it now. Luckily, I came across Rachael Ray’s version and, woo hoo! – it could be done in under an hour! 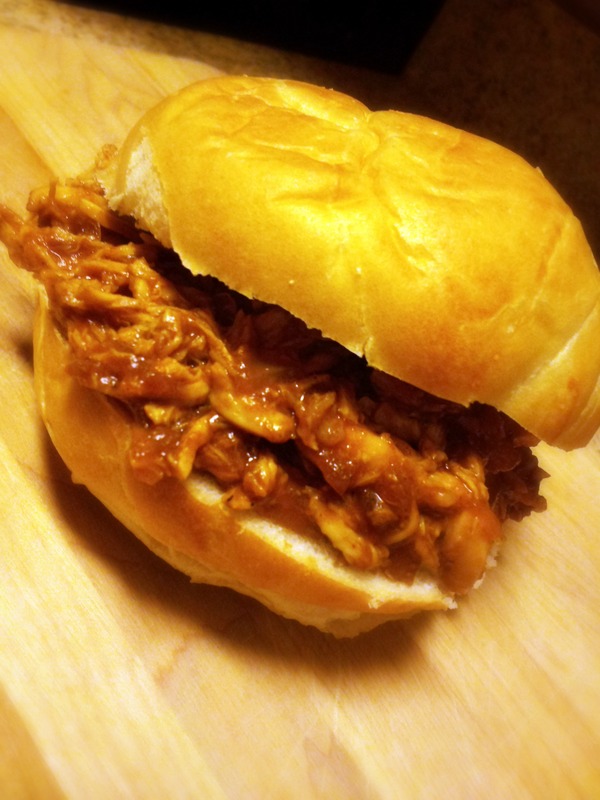 I was skeptical about making a pulled chicken sandwich in just 55 minutes, but I was BBQ-desperate and decided to give it a try. While this recipe is kinda sorta cheating and probably makes the BBQ authorities cringe, I thought it came out delicious and it certainly satisfied my craving. A plus was that the chicken (I used boneless skinless chicken tenderloins, the kind that come frozen in a bag) literally fell apart when it came time to pull it apart with two forks. That was my first clue that Rachael was steering me in the right direction with this one. Therefore, I am pleased to post this recipe (with a couple of modifications) for all of you who need a quick BBQ fix now and again! Season the chicken with salt and pepper and place in a heavy pot with the onion, garlic and just enough water to cover (about 1-1/2 cups). Add the barbecue sauce, vinegar and a few drops hot sauce and bring to a boil. Reduce the heat and simmer until the chicken is cooked through, about 15 minutes. Remove the chicken from the sauce and shred with two forks. Boil the sauce, skimming occasionally, until reduced by half, about 15 minutes. Season with salt and pepper. Add the shredded chicken and heat through. Spoon the mixture onto the rolls and top with the cheese (optional).